Best advice you are going to get is find a group of fliers near you and try theirs first..Decide what you want from there. We call it OPK or Other People's Kites. We are generally a friendly bunch and will gladly hand you the handles to allow you to make an informed decision.. Don't limit yourself to a brand as there are several competitors out there that ALL bring something to the mix..
Where are you located?? Someone should be close by that would love to help you get started on the right foot. I'm currently outside Louisville KY in the bluegrass. That's good to know because I had thought quads were a rev dominated industry and competition is usually a good thing. There is a slight correction there. I have flown a quad line mojo before at myrtle beach and I loved the quad feel. But not a Rev. I did also a while back read about Freilein and those looked very Interesting. I'm probably going to go ahead and choose something soon and order it because I graduate in a few weeks and Ill start college in a couple months after that. I won't have a-lot of time to fly. Rev has added springs to all of their kites and decided this is what everyone needs, Freilein from OSK has made strong inroads into the industry. They have better QC then Rev and I have yet to find a stray or missed stitch. 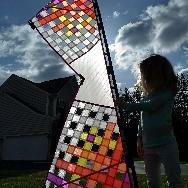 Bazzer is now making the Phoenix kites. IMO the Ashes is the best of that particular line. John Barresi is close to releasing the Djinn. Still very little is public about this sail but it dies have some true innovations both in sail design AND bridle configuration. If you must buy now, I'd say find a used B-series and start there.. It's an established workhorse and will serve you well..
Yeah I've been getting the vibe that people have been put off by rev. I've been researching for a while and I managed to find a site that sells b - series standards. And I think I am going to order one pretty soon. I also get the vibe that their new reflex is a little meh from what I've seen. What do you think about it? I really love the color pattern of the b -series I found and you said its a solid kite. So I'm like 90% sure I am going to pull the trigger on it. 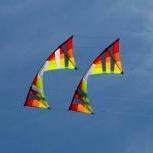 I do like the look of the Phoenix kites a-lot but I was not able to find a site that looked like a vendor. But thank you lots I really really appreciate your help taking the time out of the day to talk to me. I had a Reflex.. It didn't stay with me long. I do a lot of catch and throw and that is NOT the kite for that style of flying. You want a Phoenix or Freilein, then I'd highly suggest giving Eliot Shook a call at Flying Smiles Kites..
Bottom line is the Reflex wasn't a bad kite, it just isn't the kite for me..
Hi, Jake, and welcome to the forum. Get on the GWTW (Gone With The Wind) forum and look in the "kites for sale" section. One of the guys is selling four Revs because of a physical injury that makes it painful to fly kites. I believe two of them are B-Series Revs. Message him and see what he has. Also, they pop up on eBay frequently. You'll need handles, lines and a stake in addition. The stake can be a long screwdriver if you want to keep costs down. Welcome Jake. Never flown a quad.Will be following your journey into the Dark Side with interest. Quad I seem to keep looking at is the Freilein Transeye vented. Top of it's stated wind range is 40 mph. When first starting out a lot of people advised me when above 15 mph fly a vented quad. Got a vented duel that the more I fly it the happier I get up to 25 . Top of the line kite but I don't know if I'll ever get good on it in +30 winds. Intend to have the builder make me a different vented kite to try and achieve that. Would be nice to have a speed kite, vented quad and duel that I could become comfortable with in 30+ winds. Then my mood would be the deciding factor of what I fly. Not the wind 👹. Got to hold a OSK Freilein Exodus at a shop awhile back. Don't know much yet but the build quality was very obvious. Thought it was a really nice kite. The Kite Shoppe still has a couple of Full Vent B-series new kites. I believe the kites are on sale and I doubt that they will be there long. They also have the handles set-up with JB's knotted pigtails. The best line sets are Laser Pro Gold. IMHO B series are better made and and respond better although if cost is a major factor a classic is a great learner, the fever is real so plan on having a few within 6-12 months well maybe just some of us! The B-Series kites have John Barresi's signature on them. He designed the panel layout and that's why they are called B-Series. The word "standard" refers to the type of sail. The types are: indoor, ultralight, standard, mid vent, full vent, extra vent, and max vent (aka Vickie). Each type is intended to allow comfortable flight within certain wind ranges, from absolutely none all the way through and including gale force. The two that will cover the widest range of wind speed for you, once you have acquired basic control, are standard and full vent. Most folks getting into the hobby start with a standard and subsequently acquire either a full or a mid vent depending on average wind speeds where they will be flying. In other words, the kite "series" whether production models like the SLE and B-Series or custom like the B-Pro Series may be available in any sail type. The SLE, B, and B-Pro are no longer being made, but if you can find them are worth having. The 1.5 classic (1.5 is the size format) currently being produced by Revolution Kites has the Reflex springs that previous versions did not. It has the panel layout of the B-Series but is not a signature kite. Any of the production or custom models may also be available in other size formats, which are 1 (larger than 1.5) and 2 (smaller than 1.5), which may also be available in any series or sail type. If you're looking at what is currently on the GWTW forum, my recommendation is grab whatever you can that fits in your budget. You probably won't find a better deal elsewhere. If I didn't already have a ton of Revs, handles, lines and a Rev bag, I would buy the entire lot myself. The kites being sold are becoming hard to find. I hope that doesn't confuse you. It will become easier to understand as you learn more. It's not rocket science after all, but stunt kites have certainly gained a greater level of sophistication since their introduction. P.S. -- If you have any questions, ask. The B-Series kites have John Barresi's signature on them. He designed the panel layout and that's why they are called B-Series. The word "standard" refers to the type of sail. The types are: indoor, ultralight, standard, mid vent, full vent, extra vent, and max vent (aka, Vickie). Each type is intended to allow comfortable flight within certain wind ranges, from absolutely none all the way through and including gale force. The two that will cover the widest range of wind speed for you, once you have acquired basic control, are standard and full vent. Most folks getting into the hobby start with a standard and subsequently acquire either a full or a mid vent depending on average wind speeds where they will be flying. In other words, the kite "series" whether production models like the SLE and B-Series or custom like the B-Pro Series may be available in any sail type. The SLE, B, and B-Pro are no longer being made, but if you can find them are worth having. The 1.5 classic (1.5 is the size format) currently being produced by Revolution Kites has the Reflex springs that previous versions did not. It has the panel layout of the B-Series but is not a signature kite. Any of the production or custom models may also be available in other size formats, which are 1 (larger than 1.5) and 2 (smaller than 1.5), which may also be available in any series or sail typ . Alright Thank you so so much. I'm Hoping this website still has the B series standard and when I get home I am going to buy one. It still says they are available. It does not come with lines. Any advice on what to buy? I might just buy them off of Revs website. Thanks So much for all the advice. Ill keep you updated on my progress. 80 - 85' will be fine for solo flight. If you have any desire to fly with others - plan on getting a set of 120', all in 90# or 100#. Just remember - the shorter the line, the smaller your wind window is. And in almost all cases, take the time to check the lines for evenness. Put all 4 lines on one stake, pull them evenly and compare lengths. Most will need adjusting. Then check again after a few flights to see if things have changed. Do not trust that "New lines are equal"!! You can defeat the Reflex technology by removing the springs or getting another set of verticals without it. Then you can decide on how you like it set up. If there is one piece of advice I give - Learn to "GIVE to the Kite!!". Counter intuitive I know, but pulling just drives the sail into the ground that much harder! Learn to let the kite crash. Even step forward. It takes all the power out of the sail. Much better to walk down and straighten things up, than to find a broken kite!! GIVE!! Get a used one as your first, if possible. You're gonna beat the hell out it. No point in beating up a new one. Of course with a new one you get more usage before it wears out. Your call. Bottom line is how much you want to spend. Either way will get you started. You will need lines and handles. They are included in a ready-to-fly package if you purchase new. Sometimes you can get a used one with lines and handles, but it takes a bit longer to find unless you already have one tagged. An 80-foot line set is fine, but for $20 more you can get a 120-foot set and make it into two sets later when they begin to show wear, and the 120's slow the kite down a bit which makes it easier to learn. Get whichever makes you smile more. That's what it's all about. Welcome to the dark side! I would look at what your average local wind is in determining what to buy. Go fly OPK as much as you can. Venting is nice if your inland wind is bumpy, but will limit you to higher wind days at first. Stick to the good wind days until you stop crashing - after that any condition that doesn't break your gear is good for learning something new. Don't worry about winds above 30mph on your gear- that is not learning wind. Look for 6-14mph smooth wind with an experienced pilot beside you to minimize the learning curve. If you don't find someone local I hit Cincinnati twice a year on travel. Not real close, but maybe worth a drive if you are still flying all alone. So the 1.5 classic has springs? If you don't like them they are easily swapped. You can rotate the spring spars so they're not engaged. Then you'll use the slightly wider 5/16" spars without the spring. Some stores like A Wind Of Change will swap out the end caps and spars if you ask when you buy your kite. Or you can buy the hardware yourself and replace the six caps as fast as you can retie the six knots. The wider spars also impede performance, imho, the 1/4” rods handle better overall. You can really spank out some killer slack lining stuff with all that mass though! I grant you, it's not an original Diamond tube for responsiveness or weight savings (from the Dantonio Days), but I'm liking it in the ShooK mesh kites and even have a full-sailed B-pro trussed up that way too. Framing is another area where the pilot can influence performance towards a specific goal. Nice STRAIGHT lines (tracking is tied to a stiffer leading edge) or suddenly powered up from slack lining (a bendy/flexible frame that quickly FILLS with energy and much easier on the pilot too) This 2nd one wants to turn within it's center. The first one wants to turn on it's end-point. Compromise? you bet, but you can lean it into one direction with framing choices. I got a ultralight weight frame made from the 5/16 inch reflex stuff from Lolly to fit one of my Zens for X-mas (i'm Jewish). I've gotta tell you, that frame rocks big time. Super responsive and it has taken a severe beating too. I did have to switch out the end-caps, but this re-framing project impressed the heck out of me. It kept the low end and raised the wind range considerably higher in that direction. I carry a big selection of framing with me and will switch a light weight frame into heavily vented kite, as well I've been known to slap a fat tube in a full sail so I don't break in flight but I'm not falling out on the edges either. I'd rather "over sail" than even be under-powered, but I've got buddies who think the opposite too. Ultimately you need to experience enough choices to make intelligent decisions about your own preferences. The joy of the quads is their unbelievable versatility. You can make 'em any way you can imagine, in looks or performance. Making your own is surely one of the most rewarding experiences. But so also is the joyful expression on a kid's face when they can "do it all by themselves". This tutorial from Kitelife.com breaks down the basic method for the Up & Over maneuver on most indoor dual line sport / stunt kites.